The Art Haus SLC is a new, contemporary arts organization that will explore multiple artistic disciplines with artists from the region, the country and even from all over the world. We aim to share our artistic endeavors with our local community members through exhibitions, educational programming and online activities. We are excited to bring new artistic opportunities to Salt Lake City and hope you will join us! 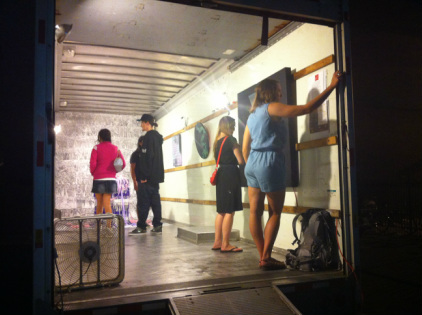 Thank you so much for all of you who came to Edison Quarter Art Walk Block Party last Friday, August 16th and stopped by our Art on Wheels mobile gallery with works by Kyle Jorgensen. The event was a total success and we are incredibly grateful for all of your support. We cannot wait to bring more art experiences to the Salt Lake City community. Stay tuned for our upcoming events. For pictures of Art on Wheels with Kyle Jorgensen go here.